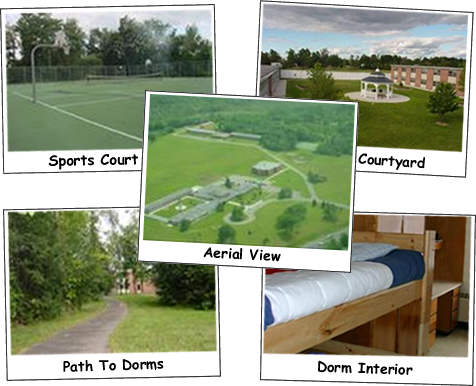 This premier troubled teen school is located in upstate New York, near the St. Lawrence River. At this school, teens are taught the skills and personal qualities needed to become responsible and contributing members of society. The Youth are challenged to step outside their comfort zone and self-imposed limits in order to reach their full stature. The boarding school provides a controlled environment that is essential to changing the course of troubled teens who are making poor and/or self-destructive choices and are damaging the relationships that mean the most to them. With 24-hour supervision, youths' behavior can no longer “fly under the radar.” In this setting, our dedicated staff have plenty of opportunities to confront inappropriate attitudes and behavior and help youth adopt productive alternatives. The school provides each troubled teen with an individualized progressive academic program which requires youth to demonstrate competency in order to advance. To assist youth in getting the most from the academic program, they begin by completing a skill-building course which focuses on reading and comprehension, memory, spelling, and vocabulary skills. Once teens complete the skill-building course, they may begin working to complete their high school requirements. A wide array of required and elective classes is offered. Students have ready access to a staff of New York State Certified teachers for additional assistance. Student education extends beyond the classroom through academic enrichment activities where youth experience hands-on learning. The structured youth schedule includes two fitness/P.E. periods, approximately 6 hours of classroom time, two group sessions, reading time, meals, and breaks. Teens attend school six days per week and have a more relaxed day on Sunday. Twice a day, teens have an opportunity to share and process their emotions in a “daily progress” group and a “reflection” group. Youth learn about the consequences of their actions through a merit system which encourages positive behavior and discourages inappropriate behavior. As youth adhere to the schedule, they improve physically, academically, and emotionally. These accomplishments help restore self-worth and provide the basis for continued growth and change. An integral part of the program is service, which helps the teens come to appreciate the joy of giving and realize that the universe doesn’t revolve around them. As the teens “give back” to the community, they learn selflessness, citizenship, leadership, and compassion. Recent service projects include a tsunami relief project, a run/walk fundraiser, and various work projects benefiting citizens in the local area. Youth also participate in Premier seminars and personal development courses. These experiences allow the teens to rid themselves emotional baggage and start their lives anew with a clear understanding of their own value and potential. They also learn to communicate effectively, be honest with themselves and other, overcome self-limitations, and confront their fears. In time, youth participate in parent-child seminars where they work through specific issues that have occurred at home and work to repair their relationship with their parents. During these seminars, parents and children create and agree to abide by a “home contract” which specifies the rules, consequences, and structure that will be in place when the child returns home.